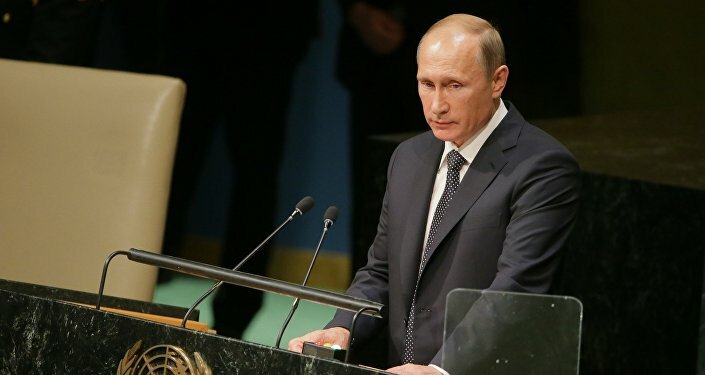 Putin delivered a much-anticipated speech outlining Russia's position to the United Nations General Assembly on Monday. Here is a summary of what he said. Russian President Vladimir Putin delivered relatively few surprises at his UN General Assembly, despite what has been described as a buildup with additional aid sent to Syria and information sharing regarding the fight against ISIL also established with Iran and Iraq. However, it went in a stark contrast to US President Barack Obama's UNGA speech, with its ideological push and calls to end the rule of leaders of certain sovereign states. Putin outlined Russia's view of the UN as a body for compromise rather than a body for rubber-stamping a certain "needed" decision, while other states (referring to the US) see that structure as "getting in the way." "During the UN's founding it was not assumed that consensus would rule here. The point of the organization, in essence, consists of finding and working out compromises, and its strength is in taking into account different opinions and points of view." Putin warned that while the UN must transform, shaking its legitimacy would be extremely dangerous. "It would be a world where instead of collective work, egoism rules the day, a world where there are more dictates and less equality, less real democracy and freedom, a world in which instead of truly independent states, de facto protectorates and territories controlled from abroad multiply." 3. We are all different, and this must be treated with respect. "No one has to adjust into one model of development recognized by someone as solely correct once and forever." Putin brought up the example of the Soviet Union, which also experimented with using ideological motivations to export social experiments, commenting that "it seems that no one learns from someone else's mistakes, but only repeats them." 4. "Do you realize what you've done?" This was one of Putin's most noted phrases during the speech, in that while he never called the US by name, instead referring to the post-Cold War "sole center of dominance," he also called it out for the consequences of its decisions. "I fear that the question will stay in the air because the policy that has at its base self-assurance and conviction in its own exceptionalism and impunity has still not been renounced." "It is already evident that the vacuum of power, which arose in a number of Middle East and North African countries led to the creation of zones of anarchy, which have immediately been filled by extremists"
Putin added that the Islamic State itself did not appear out of nowhere, and said that it was initially nurtured as a weapon against unwanted secular regimes. Putin called for a broad coalition against terrorism, something he intended to achieve since after the September 11, 2001 terrorist attacks in the US, when he suggested the idea to then-US President George W. Bush. "We are suggesting to not be guided by ambition, but by mutual values and shared interests. To unite our efforts based on international law to solve the issues we are facing, and to create a truly broad international anti-terrorism coalition"
Putin also said that Muslim countries must become the key participants of the coalition and called on Muslim religious leaders to use their authority and mentorship to prevent the recruitment of new fighters by extremists. Putin added that restoring statehood to countries such as Libya and Syria which lost it as a result of conflicts is key to solving the issue of large numbers of refugees fleeing them. "The refugees need compassion and support, but this issue can only be solved radically by reestablishing statehood where it has been destroyed. " Putin said that Ukraine, like other post-Soviet countries was forced to choose between East and West, which led to its civil war after the 2014 coup. He called the full implementation of the February 2015 Minsk agreements the sole way to resolve the issue. "It is impossible to ensure integrity of Ukraine by threats or by use of force. But it has to be done. A real consideration of interests and rights of people in Donbas is needed, respect of their choice, coordination with them of key elements of the political system of the state, as stipulated by the Minsk agreements." Putin criticized the creation of exclusive trading blocs as going against the idea of the World Trade Organization and principles of free trade, as well as the use of politicized economic sanctions to accomplish countries' own goals. "Maybe, [they] want to put us all before the fact that the rules of the game have been rewritten, and rewritten again in favor of a narrow circle of the chosen, without participation of the WTO. This could lead to a complete imbalance of the trading system, the fragmentation of the global economic space. " Putin also called for new approaches to solving climate change, such as the introduction of new, technologies which do not harm the environment but exist in harmony with it, and noted Russia's own commitment. "Within the framework of our national contribution, by 2030 we are planning to curb our greenhouse gas emissions to 70-75 percent of the levels of 1990."